The Public History concentration is designed for graduate students who are primarily interested in careers in archival administration or museum management. It provides students with both theoretical and practical training in these areas. 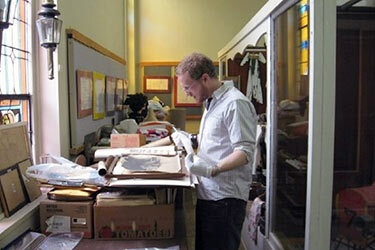 Public Historians apply their skills and knowledge outside of academic or classroom settings. The Public History concentration at Wright State University integrates a traditional history curriculum with courses taught by professionals in archives, museum studies, and historic preservation; an internship; and a project leading to a Master of Arts degree in history with a specialization in public history. Students in the Public History concentration are required to complete 6 hours of seminar (HST 7100- 7830), Historical Methods (HST 7000) and either an additional seminar or one 6000-level course. One seminar or 6000-level course may be in non-U.S. History. Students may choose breadth over specialization by taking three credits each in Museum Studies and Archives and Records Management. Students also have the option to specialize and take six advanced credit hours in either Archives or Museum Studies. Additional advanced classes can be taken as electives to strengthen the student’s program. Students may select from advanced public history courses and the following Public History electives. With the approval of the Public History concentration director, students may take courses in an outside discipline such as art, anthropology, urban and geography, English, education, and business.